We all take great pride in our gardens and love to see our trees and shrubs grow and mature. But what happens when your once small trees become overgrown and unmanageable? This can, in some cases, become a problem for both the homeowner and their neighbours. What problems can overgrown trees cause? 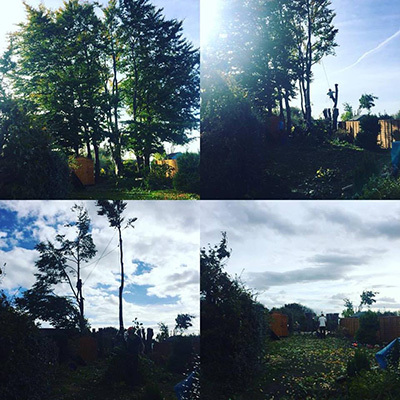 These images show a tree removal job that we completed in Stockport. Each of the pictures take you through the removal process. Before starting, it is often a challenge to imagine what the space will look like once the trees have been removed. The process is carefully considered prior to commencing the work. The images show how the trees were stripped and then the stumps removed. The beech trees were successfully removed, and our clients were exceptionally pleased with the results and service they received. Their garden was left full of light. Many of our clients have questions about overhanging trees. Did you know that you are entitled to cut branches that overhang onto your property? The law states that you must offer to return the cut material to the owner. It is also important to realise that if you cause damage or harm to the tree that you can be held responsible by the owner. To check whether you live in a conservation area or whether the tree/s are protected by a Tree Preservation Order. Further consent will be required if this is the case. Our advice would be to you would be to contact Bostock Total Tree Services on 0161 483 7816. We are happy to provide you with information and advice that will help you make the right decision for your trees. Call today to request a no obligation quotation.